Siam Makro Public Company Limited and Suan Luang District Office jointly planted 1,099 Marigold trees to display loyalty and in remembrance of His Majesty the late King Bhumibol Adulyadej. Act 2 Lt.Somsiti Kongtanasansit Director of Suan Luang District Office and Mrs. Suchada Ithijarukul Chief Executive Officer of Siam Makro Public Company Limited, together with Makro executives and employees, participated in the ceremony at Tara Pattanakarn Building, Pattanakarn Road. 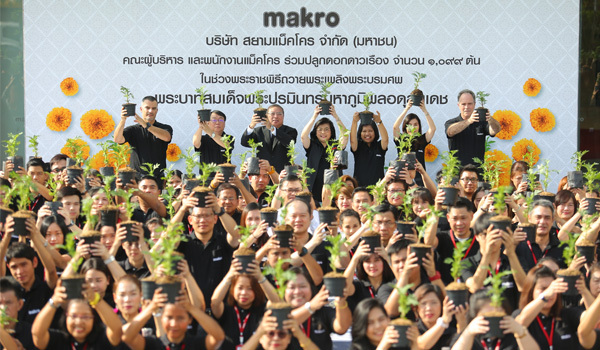 Makro also handed over 1,099 Marigold trees to Suan Luang Office for distributing to the public.